Don't Try This At Home. Really. 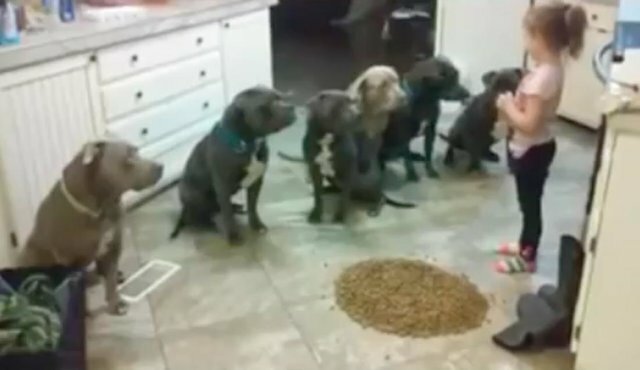 A video of a four-year-old girl feeding her six dogs is impressive, but even pit bull advocates say the situation isn't one people should rush to replicate ... with any type of dog. 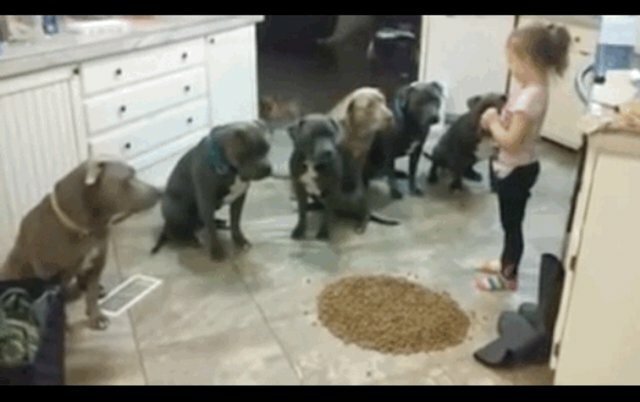 The little girl addresses all six of her pit bulls by name, telling them to sit and watch obediently while she lays out their dinner. The dogs appear to obey her every command, waiting until she gives them the go ahead to eat from one giant pile of food. While the dogs in the video seem well-trained and focused, experts say that mixing kids and dogs at mealtime can be a recipe for danger. Dr. Robert Proietto, a veterinarian in New York City, spoke to The Dodo about why the video is an example of an unsafe situation, making clear that the breed of the dog has nothing to do with his concern. "While I love this video for how it shows that pit bulls are some of the sweetest dogs that exist, and they should not be discriminated against in any way, it is always unsafe to put your children in situations where there could be abnormal behavior," Proietto said. He added that dogs can be unpredictable, especially in packs and when they are presented with triggers, which include limited resources like food. "I am a huge proponent of pits and pit mixes, but I am also a proponent of keeping your children safe, and children should never be left unmonitored with dogs," Proietto said. "It doesn't matter if it a pack of Cavalier King Charles spaniels, German shepherds, Frenchies or pits." "While the dogs' self-control is impressive, the message being conveyed is not," she wrote, "There are a few well known triggers of aggression between dogs, among them crowding and the presence of food. Putting two of these potential triggers together is simply unsafe. Yes, apparently these dogs are not competitive or aroused over their kibble, but feeding them in a head-to-head (to head) arrangement like this isn't safe, nor is it relaxing for the dogs." Courtesy of the North Shore Animal League, here's a list of tips to keep everyone safe when you live in a household with pets and children. Never leave a young child unsupervised with an animal. Accidents happen even with the most trustworthy children and pets. Never approach any animal, even your own, when he or she is eating, sleeping, chewing on a toy, in its crate or caring for its young. Don't let your child touch a dog or stand near him during times of heightened excitement - for example, while the dog is eating; when someone comes to the door; or when the dog is barking at a squirrel in the yard or at someone through the window. You can see the complete list here, and remember that there are lots of ways to involve kids in caring for pets that are safe, supervised and fun for all involved.